Buying a cheap dog kennel shouldn't be too difficult as there's some great deals to be found. Just make sure the cheap kennel you buy is practical and of good quality. With so many pet shops and online retailers selling dog kennels these days, there's sure to be a bargain or two out there somewhere. If you are clever and shop around, you can definitely save a few pounds from your budget! Your first task when looking for a cheap dog kennel should be to shop around and find the best deals you can. You should try your local pet shops first perhaps. One of them might have a sale on, to help you save money. 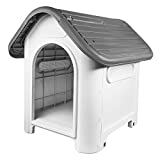 Check out this selection of dog kennels available on Amazon. Yes, they sell everything! We have included some cheap ones and some expensive ones so you can compare and contrast. Use the internet too - there's a wealth of online websites that sell cheap dog kennels. Keep a note of the prices that each website offers so remember which the best deal is. Remember to have a look at the delivery costs too. The cheapest kennel might have a huge delivery charge, which means you might be out of pocket. You could also save a pretty penny by buying a second hand dog kennel. This is bound to be cheap. Check your local magazines, newspapers and shop windows. If you buy a used dog kennel from someone else, just remember to have a good look at the quality before deciding to buy. 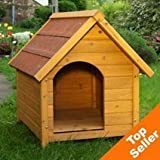 If you are looking for a wooden dog kennel, it might be more expensive than a plastic one. You should think about which is most suited for you and your dog. Will the kennel be outside? Will it be inside? Will it be sheltered? Obviously the smaller the dog kennel, the cheaper it is. This isn't where you should decide to save money. Your dog kennel should be big enough for your do to be happy whilst inside it. A dog kennel that's too small is cruel and may lead to your dog being very unhappy. If you aren't sure what size to buy, just ask a member of staff in a pet shop. It may also depend on how long your dog will spend in the kennel too. If it's just whilst you pop out for lunch then it may not need to be as spacious as when your dog is spending hours in there. Most important of all is the quality of your dog kennel. You shouldn't sacrifice quality for a few pounds here and there. The kennel you choose should be solid, hard wearing, spacious and safe. This is imperative. Finding a cheap dog kennel shouldn't be difficult. Just shop around for the best deals, but don't sacrifice quality. Happy bargain hunting and let us know how you get on!